Set the stage for a prosperous career in business with the Accounting diploma program at BCIT. By training with knowledgeable, experienced instructors who are respected professionals in the accounting industry, you’ll learn how accounting is the backbone of businesses big and small. In just two years, this highly experiential program will prepare you to step into a corporate office or head back into the classroom to complete your bachelor’s degree. The road to CPA designation is an easy one with the accounting programs at BCIT. Learn more about accounting accreditation and designation with our Program Details. Who should apply for the Accounting Diploma? Ready to enroll in the Accounting diploma program? Visit Program Entry to get started. Thanks to the comprehensive courses included in the Accounting diploma program, graduates of the program are ready for entry-level and mid-level positions in a variety of business settings. They are also prepared to further their education by completing a bachelor’s degree in just one extra year. To find out more about the positions Accounting diploma grads enter, visit Graduating and Jobs. Students should be aware that course exemptions can be claimed for a maximum of two courses per level. Please note that not all optional courses are offered every year. Offerings are at the discretion of the program faculty. The course will begin with an introduction of what to expect and what is expected of students in the programs. Continues with academic and business expectations. Through a series of short lectures, video, discussions, panel discussions, exercises, and role playing, students will compare differences in acceptable behaviours and ethics in various academic and business environments. Topics will include: acceptable/expected behaviour in academic/business various situations, dress codes, cell phone and other technology usage, communications, ethics. This course is the first of two designed to introduce the theoretical and practical foundations in accounting. Topics include accounting concepts and principles; income measurement; business transactions; adjusting and closing entries; financial statement preparation; the accounting cycle; merchandising operations; and accounting systems. Students must achieve a minimum grade of 50% in FMGT 1105 or 70% in FMGT 1100 to take FMGT 2105. This is a capstone course which provides the opportunity to integrate various accounting disciplines including financial accounting, auditing, managerial accounting, finance and taxation through the use of an integrated case simulation. The objectives of this course are to provide students with: scenarios that are likely to be encountered and tasks that may be required to be completed upon graduation, opportunities to demonstrate effective time management and team skills, opportunities to apply the skills and knowledge they have obtained at BCIT in an integrative approach, and confidence that they have much to offer to a potential employer. This course will require students to work collaboratively in groups. Prerequisite: Completion of Level 3. Students who complete the course will know the payroll compliance responsibilities that affect organizations, apply payroll legislation and calculate individual pay. This includes all components of individual pay from remuneration, through deductions, to net pay for both regular and non-regular situations. Students will have the content and skills to effectively communicate all aspects of the individual pay calculation process to external and internal stakeholders. Graduates of this course will be able to calculate and report the government and third party remittances, year-end requirements and accounting for payroll at the compliance level for the organization. They will also be able to effectively communicate these organizational processes and requirements to internal and external stakeholders. Through a series of guest lectures, presentations, research, and informational interviews, students will gain an understanding of the variety of careers in the accounting profession and will improve their written and verbal communication skills. Topics may include: networking in a professional setting, interview skills, resume preparation and career skills in the accounting profession. Prerequisite: Third level of the Accounting Diploma. The accounting profession, through its professional bodies, recognizes a wide variety of subjects offered in the program. The Canadian Institute of Chartered Accountants, the Certified General Accountants' Association of Canada, the Certified Management Accountants Society and the Canadian Credit Institute give credit for various subjects, and our graduates are able to achieve a professional designation within two years of receiving their BCIT diploma. Universities will give credit for subjects taken in the program to those students who wish to continue their training and qualify for a university degree. Block transfer credit arrangements are in effect with Thompson River University, Simon Fraser University, the University of Northern British Columbia, Royal Roads University and Lakehead University. Successful graduates who complete additional training can expect, with significant varied experience, to achieve middle to senior management positions earning annual salaries in excess of $60,000. Achieving this level of success means starting in entry-level positions in financial accounting, cost accounting, internal audit, budget preparation, brokerage, banking, trust and insurance, with starting salaries as high as $3,000 per month. Do you have a degree, diploma, or completed a substantial amount of post-secondary courses? You may qualify for advanced placement into the Accounting program. Students that qualify for advanced placement can enter the program in the middle of first year depending on the number of transfer credits received. For more information about eligibility requirements and the application process, please download the Accounting Advanced Placement Guide [PDF]. 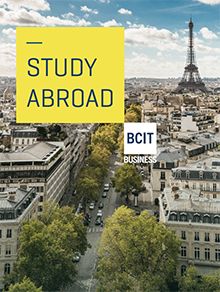 The BCIT Graduate Certificate in Business Administration is also a viable option for students that have completed a bachelor's degree. This is an eight month full-time program that leads into a number of international MBA programs. Mr. D. Chew, DJ Chew & Associates Consulting Ltd.
As a graduate of the Financial Management Professional Accounting Diploma and Bachelor of Technology in Accounting, I feel that my experience through the programs not only has given me the skills and technical knowledge that I needed to excel in my career at Meyers Norris Penny LLP, but also gave me the technical knowledge and the discipline that is required to make it through CASB and successfully pass the UFE. Jay Parley, CA, Meyers Norris Penny LLP.